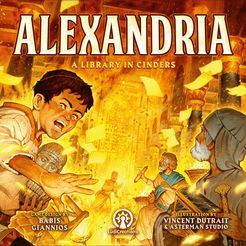 Alexandria is a competitive tactical board game in which each player takes the role of a hero who is present at the great library in Alexandria on the fateful night that left it reduced to ashes. Each player strives to leave the library as the sole survivor and only witness to the course of events. Going through the manual for the first time takes a little while, but setting up a game is a rather quick process and gameplay proceeds at a good pace, even during the first game. What takes a bit of getting used to is the fact that after reading the rule book, you will likely have no idea about how the game actually plays. Instead, there is a second manual, the "Alexandria companion" that guides the players through an example game, provides a strategy guide for each of the heroes in the game, and provides some background information on the people, items and written works you can find in the library. The game "board" is made up of five square room tiles per player (i.e. 10, 15, or 20 tiles) that are shuffled and drawn randomly and then layed out according to guiding symbols on the back of the tiles. As a result, each game of Alexandria is going to be slightly different. As the photos might suggest, each room allows passage to all adjacent rooms, so the variation will be limited to the overall shape of the library and does not affect how you can move from room to room. Inside each room there are four furniture tiles (again, drawn randomly) that, when revealed, represent items the heroes can interact with: chests, armoires, book shelves, lecterns, braziers, and carpets. As the heroes explore the rooms of the library, these tiles are revealed. Placed next to the game board are three decks of so-called rescue cards, one each for items, books and people. Each player has a hero board for their hero and a deck of twelve action cards from which they draw a starting hand of five. These cards are specific to each hero, and while in many games the differences between characters are often superficial, in this game the card decks of the heroes are dramatically different from each other. Each hero scores points in their own way and requires a strategy that specifically takes that into account. In addition to their deck of hero cards, each hero has a special ability that is indicated on their hero board and can be triggered once per turn. 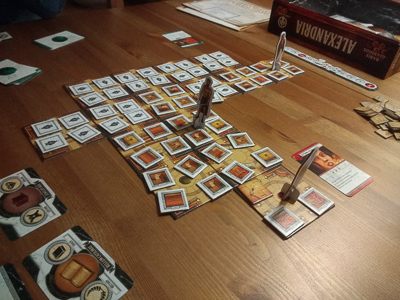 A game of Alexandria lasts exactly five turns, with players expending "time" during the course of each turn in order to execute specific actions. Rather than relying on a fixed turn order, the hero who has the most time remaining will be allowed to perform an action. There are common actions with fixed costs like movement and drawing a card from the hero deck, but when players want to bring cards from their hand into play the time cost is indicated on each of the cards and can vary across a wide range. Most of the time, a card will allow a player to score points in a certain way, often by interacting with, or discarding, a piece of furniture. There are also few cards that can be played out of turn and at no time cost as a response to certain events in the game. 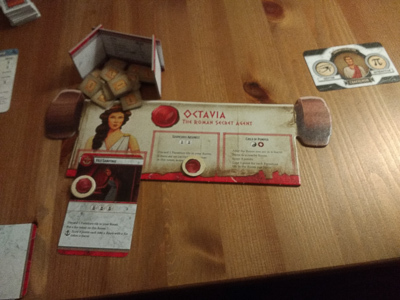 Octavia: This lady is a secret agent for the Roman empire. Her goal is to see the library burn. She may pick up an occasional book (with a strong preference for political works, which can give her bonus points) or shove a senator out of harm's way, but mostly she will want to set fire to everything within reach, as long as no one sees her do it. Unsurprisingly, Octavia will mostly score points for setting things ablaze. Tabitha: A scribe from Palmyra who wishes to salvage as much knowledge as she can from the collapsing library. Due to her profession, she is very efficient at finding valuable books and items. Quiet and swift-footed, she is not beyond thieving and will happily relieve other heroes of items or books they have recovered. Tabitha scores most points by gathering items, with some bonus opportunities if the resulting collection is as varied as possible. Ptolemy: This Macedonian royal guard is an insufferable do-gooder who is set on getting everybody out of harm's way and emerging as the shining hero that prevented an even greater catastrophe. While this is a noble goal, it does tend to interfere with the goals and motivations of the other players. Ptolemy scores points by assisting other heroes (and has the ability to force them to accept his help) and saving people (represented by furniture tiles depicting the lecterns they use during their studies) from the flames. Neferhotep: An Egyptian architect that has the uncanny ability to identify the parts of the library that are structurally unsound. He obviously enjoys it when less educated people fail to identify these dangers and fall afoul of them. In terms of gameplay this effectively allows Neferhotep to lay traps for the other players, scoring points when he manages to lure or force other players to spring those traps. Search cards allow players to draw cards from one or more of the rescue decks. In addition, a specific amount of points may be awarded if a certain type of rescue card is drawn as a result. Other than that rescue cards have no immediate value, but they may yield additional points at the end of the game, or based on a hero's abilities. Peril cards are specific to Neferhotep and allow him to lay traps for the other players. Cards that allow you to interact with or discard a specific item of furniture and yield immediate points as a result. Cards that affect one or more competing players in a negative way. Cards that affect one or more competing players in a positive way, yielding a (typically greater) positive effect for the hero playing one of these cards. Response cards that can be played out of turn as a reaction to a specific condition. The result can be protection from a negative event, triggering a positive event for the hero playing the card, or triggering a negative event for some other player. Slottable cards that are not discarded after they are played but are instead placed in the provided slot on the hero board and are from then on treated like a special ability (i.e. they can be used once per turn at the indicated time cost). A number of one-of-a-kind cards that do not fall in any of these categories. Playing a card will often require a certain piece of furniture to be present in the room. E.g. search cards allowing to draw from the book rescue card pile will typically require a bookshelf to be present in the room, lecterns are often required to draw a person rescue card, etc. Many cards will also require players to remove one or more furniture tiles from the room they are located in. Most of the time, these tiles need to be discarded and limit the cards that can be played in the room. Some rarer cards allow players to move furniture from one room to the next. Another interesting aspect of the game is that some cards allow you to draw some of the time requirements from another player, provided that player is in the hero's room or one adjacent to it. Any such assist will be compensated by awarding one point to the assisting player. Combined with the time-based turn order and the right cards, it is actually possible to starve an opponent of most or even all of the time they would have available during the turn. At the end of each round, a number of rooms equal to the number of players in the game is burned. The rooms and all furniture are removed, any heroes remaining in them will be moved to an adjacent remaining room and suffer an effect detailed by the "destiny response" on their hero board (although "suffer" may be too strong of a term here, as some heroes can actually benefit from being in a room that is burned). At the end of the last round, all remaining rooms are burned. 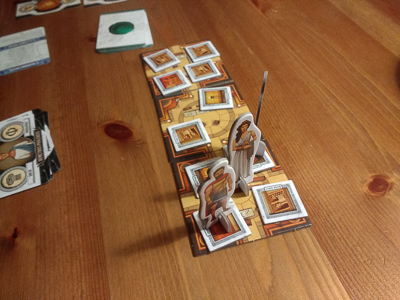 This results in an ever-shrinking play area that keeps players on their toes and changes the game dynamic over time: Close quarters will favour Neferhotep and Ptolemy, whereas Tabitha and Octavia work better without interference from other characters. While the former will be aiming to work up a big enough lead in the earlier rounds, the latter have a better chance of catching up but are not as likely to score big in the initial rounds. Each player character has two "dramatic end" cards at their disposal, one of which they must choose at the beginning of the game and which are then shuffled into a tiny deck. These cards are revealed at the beginning of specific turns (depending on the number of players) and will typically modify the scoring, so that e.g. drawing a certain type of rescue card will be rewarded with bonus points. The effects of these cards are applied cumulatively and ensure that each game of Alexandria progresses slightly differently (not to mention that it is nearly impossible to just pick a strategy in the beginning and then stick with it through the entire game). The combination of all these factors make Alexandria a highly enjoyable game. It provides sufficient complexity and depth to keep seasoned gamers engaged. At the same time the rules ensure a good pace and they are simple enough to grasp for more casual players that want to progress to more "serious" games. 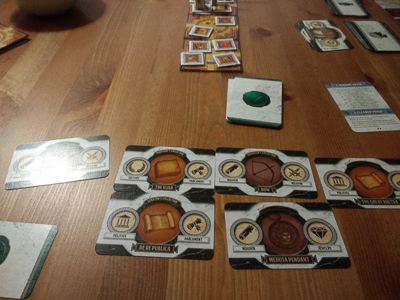 Direct player interaction in Alexandria is limited to stealing other players' time through forced assists and the effects of some cards, but indirectly their actions will affect each other's strategy, since setting rooms on fire and removing certain pieces of furniture from rooms will limit the other players' ability to play action cards from their hand and, by extension, their ability to score. The variable game board, effects of the "dramatic end" cards, and the fact that each of the heroes plays very differently, make for a high replayablility value. While the card decks add an element of randomness to keep things interesting, the lack of dice ensures that skill has a much greater value in the game than chance. The slottable cards also add variety and can dramatically change the way in which a hero plays i.e. scores points. Visually, the game board is quite utilitarian, but the cards and characters are executed in high quality and help to set the mood for the scenario. All items, written works and persons encountered in the rescue card decks refer to actual historic artefacts, books and people, each of which has an explanatory paragraph in the "Alexandria companion" dedicated to it. The game would work as well without those explanations, but it definitely adds a nice touch.